Couple your shafts end to end! We sell couplings in a variety of sizes and styles. Couplings are simply used to enable a motor to turn a lead screw, or other type of shaft. There are two types of couplings, rigid (one piece), and flexible (an assembly of pieces). 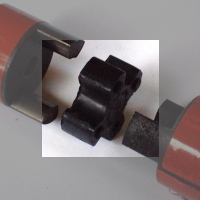 Flexible couplings are composed of two hubs and a central spider. 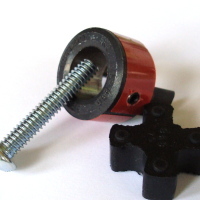 One hub is fastened to a motor shaft with a set screw. 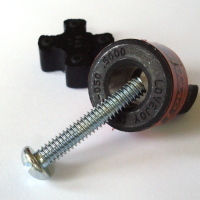 The other hub is fastened to the lead screw end. The rubber spider enables the two hubs to connect and turn while still allowing for a bit of flexibility in alignment and angle. Below, you will find rigid couplings and coupling sets that include two hubs and one spider for common uses, and you can purchase coupling hubs and spiders separately. Please read the conditions of purchase prior to purchasing any products offered by BuildYourCNC.com. 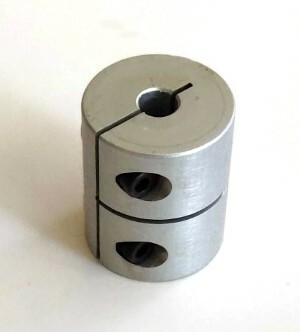 With this coupling, the motor shaft with a 1/2" diameter will be inserted in one end, and a shaft, or lead screw also measuring 1/4" in diameter, or vice versa, will be inserted into the other end. Generally, the motor shaft with a 1/4" diameter will be inserted in one end, and a shaft, or lead screw measuring 1/2" in diameter will be inserted into the other end or vice versa. Rigid couplings will keep backlash to a minimum, since the coupling is one single piece. 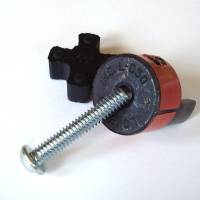 Generally, the motor shaft with a 1/4" diameter will be inserted in one end, and a shaft, or lead screw also measuring 1/4" in diameter will be inserted into the other end. The screws that clamp the shafts will be tightened, but not too much. These types of clamping couplings will not damage the shafts. 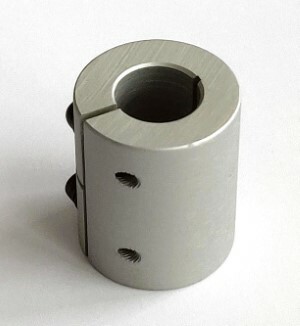 Rigid couplings will keep backlash to a minimum, since the coupling is one single piece. 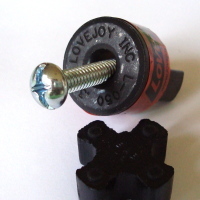 This hub is typical used to fasten to a 1/2" lead screw.